The ‘warts and all’ story from the mayor who put northern South America’s Colombian capital Bogota on the map through its buses is expected to draw a large crowd to hear him speak at Sydney’s Tattersall’s club this Friday. Noted as a passionate speaker, former Bogota Mayor Enrique Peñalosa will share his experience on how his city was transformed with a bus rapid transit system. During his mayoralty Peñalosa scrapped plans to build a network of highways throughout the city and, for a fraction of the cost, created the Transmilenio Bus Rapid Transit (BRT) system now regarded as the world’s best for its capacity, speed and cost efficiency. Institute of Transport and Logistics Studies Director Professor David Hensher says Peñalosa’s visionary initiative offers lessons for Sydney’s urban planners. 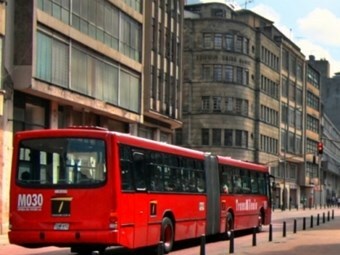 "Transmilenio has more than halved travel times for many, moves 1.3 million Colombians a day, resulted in 7,000 fewer buses and reduced bus fuel consumption by 50 per cent," Hensher says. "It’s small wonder planners from first world cities are now trying to replicate Bogota’s success." Hensher says Peñalosa is an inspiration for those who think BRTs offer an affordable and sustainable solution to easing the traffic woes in burgeoning cities like Sydney. "His talk on Friday promises to be a passionate discourse on an alternative, offering excellent opportunities for urban Australian cities as proven by Brisbane’s BRT." The University of Sydney’s ITLS is co-hosting Friday’s event and is part of a consortium that last year received a US$3.5 million grant from the Volvo Research and Education Foundation to establish the Centre of Excellence for Bus Rapid Transit development. Bookings to hear Enrique Peñalosa speak this Friday at 12pm are essential. RSVPs close today by contacting business.itlsinfo@sydney.edu.au or 02 93510019. * Colombia borders the central American isthmus linking the two continents of North and South America.